Michael Mizrachi had the bring in and faced a completion raise by Xuan Liu, who started the hand with just 37,000. Mizrachi quickly raised and Liu called off. Heads-up action between Xuan Liu and Brandon Shack-Harris. Shack-Harris was the bring-in with the , and Liu raised with the . Shack-Harris raised it right back, and Liu made the call to proceed. Shack-Harris bet it the whole way, and Liu was put to a decision on seventh street. 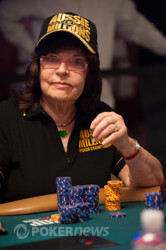 She had just 15,000 chips left in front of her as she faced the final bet. After a few moments of pondering, she surrendered her cards into the muck. Shack-Harris flashed a and a to show the wheel, and Liu knocked the table in acknowledgement. Liu managed to split the next three pots she played, snagging the low half on each hand to claw back up to about one big bet. Xuan Liu brought it in and then called the raise by Yarron Bendor after the rest of the field had gotten out of the way. Liu then took the lead on the turn and led out, which Bendor called. Again Liu led out on fifth but this time Bendor raised. Liu only had 18k remaining and called off. Liu was behind when the money went in, but sixth street treated her kindly as it delivered trips. Seventh changed nothing and she doubled on the hand. Not long after, Liu would bring it in for the full 20,000 and was called by Bendor. The latter proceeded to check-call a bet on the turn before leading out on fifth street. Liu not only called that bet but also bets on both sixth and seventh. 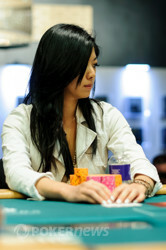 Liu began to pull her chips back and it was clear she was under the impression that she had a low. It was quickly pointed out to her that all she had was a pair of deuces, which meant Bendor scooped the pot. Needless to say, it was a costly mistake by Liu. Heads-up between Yarron Bendor and Chris Bjorin. When Bendor bet fourth street, Bjorin stuck in a raise. The Swede bet it the rest of the way with Bendor check-calling once he picked up the lead. He called one final bet on the river, holding kings up. Bjorin had that beat. He tabled / , and his wheel givs him the scoop. After Brandon Shack-Harris brought it in with the , Michael "The Grinder" Mizrachi completed and Chris Bjorin put in a raise. Shack-Harris got out of the way and Mizrachi called before betting the turn. Again Bjorin raised and this time Mizrachi slowed down after making the call by checking fifth street. He ended up check calling a bet before folding on sixth. Heads-up action between Yarron Bendor and Xuan Liu. Liu bet her lead on fourth street, and she bet again on fifth. Bendor raised that bet, though, and Liu called. They both checked on sixth street, and Liu fired back out on seventh. Bendor raised again, but Liu raised right back. Bendor called. Liu showed up / — all the aces in the deck. "Low!" Bendor found half of the pot. He showed / , and they'll take their money back. Xuan Liu brought it in and cleared the field all the way around to Todd Brunson, who completed. Liu made the call and then bet out after Brunson checked the turn. The latter made the call before check-raising all in for just 3,000 more over Liu's fifth-street bet. Three-way action here between Michael Mizrachi, Bonnie Rossi, and Cory Zeidman. It resulted in the elimination of Bonnie Rossi. The lady was doing the betting when we joined the action on fifth street. Call-call. On sixth, Mizrachi bet his pair, and that was called in both places, too. Mizrachi bet dark before seventh street. Rossi called all in for her last 20,000, and Zeidman called too. Neither of them would get any of this pot. Mizrachi revealed / , and his set of deuces earned him the pot and the knockout. The players have stepped away for a scheduled break. We'll be back in 10 minutes. The stacks are starting to become a bit more polarized here at the final table. After Bonnie Rossi brought it in with the , Cory Zeidman called and Yarron Bendor completed. Rossi got out of the way, Zeidman called, and it was off to the turn. Zeidman ended up check-calling a bet before taking the lead on fifth and firing every street. Bendor ended up folding to Zeidman's bet on seventh street, but not before showing his opponent that he had cracked rolled-up fives. Xuan Liu completed with the showing, and Brandon Shack-Harris raised with the . Bonnie Rossi called with her , Cory Zeidman called with the , and Liu called the extra bet to see fourth street. Fourth street checked around, and Zeidman fired the first bet on fifth. Liu was the only caller, and they were heads-up to sixth street. 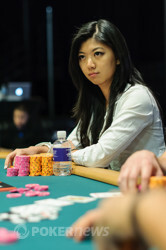 Liu checked her betting lead, and she tank-folded to a big bet from Zeidman. The players have successfully relocated to the stage here in the Pavilion Room and the cards are back in the air. The chips have been racked up, and our players are on the move. We're headed over the the adjacent Pavilion room where the secondary featured table awaits! Event #4's final table will commence in just a few minutes. Well, we have just two ladies left. 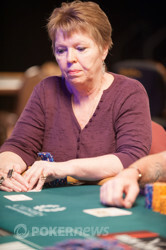 Aussie Marsha Waggoner has just been eliminated at the hands of Yarron Bendor. When Bendor bet fifth street, Waggoner raised. Bendor raised again, and the call put the lady all in. She was in trouble, as Bendor had started the hand rolled up. 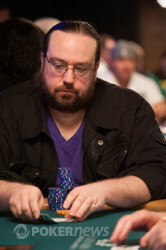 Bendor didn't fill up with his river , so Waggoner was drawing live to the heart flush. It was her only shot at staying alive, but the river was the wrong shade of red. The was no use, and she's been eliminated on the final table bubble. 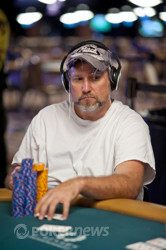 After doubling Marsha Waggoner, Chris Tryba was left with a stack of approximately 60k. He ended up having the bring in and made it the full 12,000, which Brandon Shack-Harris ended up raising. Tryba fired back and eventually all of his chips got in before the turn. Shack-Harris ended up making a flush on sixth street which meant Tryba needed either a six or four on seventh to stay alive. He squeezed it out, but it was not meant to be as he flung it to the muck. We picked up Sanjay Pandya's final hand on fourth street as Yarron Bendor check-folded. That left Pandya and Chris Bjorin heads-up. 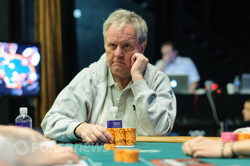 Bjorin bet fourth and fifth streets, and Pandya put his last 5,000 into the pot on sixth, revealing from his down cards. He had a low draw, and Bjorin's river didn't change that. Pandya was trailing, and he needed to catch a card to stay alive. He couldn't. His last card was a blank , and that's no good. Bjorin takes the low with the seventy-five and his ace-queen high was good enough to give him the scoop. Pandya is out in 11th place, good for more than $10,000.